I decided that the wagon must be as cheap, simple and flexible as possible - and be no more than a couple of hours work - so the challenge was on! (please note the health warnings about the dust and take the appropriate precautions). I have to admit that I was pleased with the result (below right) so I bought four more packs to make 5 wagons (I think I could have made six as there are plenty left! I could have used the most basic fine toothed saw and perhaps a mitre block to cut the labels, but I used a general purpose chop saw for speed. A ruler to mark out, but a digital caliper is easier, I find. Sand paper for sanding - but I used a bench sander (and I used a proper mask as I am told that bamboo dust is high in silica and should not be inhaled). I used a modelling board with a right angle edge to get the frame square and used some thin plastic sheet under the work to stop the glue sticking the wagon to the board. You could use PVA glue, but for speed I used a good quality gel super-glue with an accelerator spray. Oh yes, a set of cheap Chinese nail punches comes in very handy - but more of that later. 29mm curved spoke wheels and GVT coach axleboxes were from Binnie Engineering. The coupling hooks are panel made from steel panel pins. I made these to the same basic dimensions as my GP wagons, which run on 32mm track. They are 75mm wide and the length of the frame is 8 x the width of the plank (about 144mm). If you are running on 45mm track then you may need to be a little wider, depending on the axle boxes used. The overhang at the sides is the thickness of one board, so the end frame boards will be the width less 4 x the board thickness (59mm in my case. 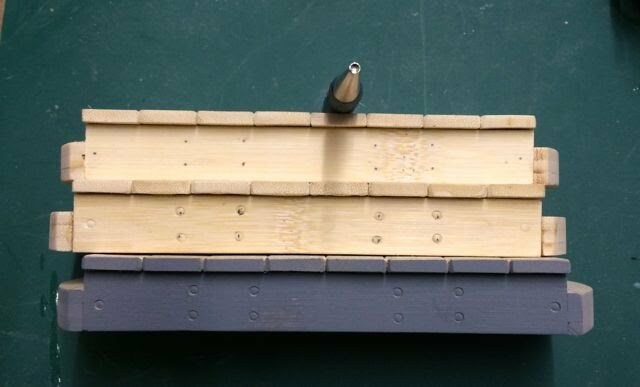 Although the boards will make a frame deeper than on my GP wagons, it allows the buffer/coupler to be dropped to match the height. As mentioned above, I used the chop saw and used a piece of scrap wood under and behind the planks to minimise tearing. I used three planks at once , so three cuts gave me nine planks. I laid 8 together and measured for the long frames - and cut the two together. Then the end frames were cut and I was ready. The real advantage of the super-glue is that it needs no clamps and was stuck in seconds. Before fixing the planks, I slightly sanded the top edges and the corners. I then put the frame on two of the labels on the modelling board, to raise it up, and then put a plank behind it to give the correct space to the back edge. Raising it up prevents that space being glued in place! I have to confess that although it then sounds (and is) simple to glue them all in place, I managed to get it slightly wrong on my first attempt and needed some gaps to give me the right length. The reason was that I gave my first plank a slight overlap at the end - it should be flush. I sanded the overhang off on the bench sander. Here you can see the gaps - I think that they add character! Now I wanted to have the fixing nails (or maybe screws) showing so I used my fine nail punch (which has a dished end). With the wagon on a steel 'anvil' two taps with a tack hammer made a perfect imprint - much better than on soft wood. I wanted to have dumb buffers and so used three lengths of the bamboo glued together. I made these the full width of the frame and laminated them with the super-glue. I applied the glue to both sides of the middle plank and sprayed the inner surface of the other two. Then it was very quickly put together and immediately clamped in a vice. After ten seconds or so it was ready to work on. Take care not to stick yourself to the wagon - PVA and clamps will be safer! I used the thickness of a plank to mark the line and then a suitable paint tin to mark the curve. I then shaped it freehand on the belt sander (please note that it is essential to wear a proper particle-proof mask and vacuum up any dust - it is nasty stuff). These were then super-glued in place on a flat surface. For the coupling hooks, I use 2" (50mm) panel pins which are about 1.8mm thick. I clamp the pointed end in the vice and cut the head off. Then, with the pin heated to red heat using a cook's blowtorch, I bend the top to the left and then blow that to the right and finally shape the hook and allow to cool. The buffers are drilled and after cutting to length, the hook is glued in. The GVT axle boxes needed drilling out to 3.2mm and also a bit deeper. I decided that I wanted some coach-bolt detail on the frames, so I marked out what looked about right and used small brass pins. The tie down brackets are wire staples pushed into drilled holes. All are snipped off inside before fitting the axle boxes and wheels. Below you can see that I used an offcut to mark out for the holes. It is better to do this before fitting the wheels. And here is the completed wagon before painting. Now with brass pins, I should have etch primed them before painting, but I didn't and the ordinary grey primer scrapes off very easily. I gave it all a couple of coats of the grey primer and then remembered that I had intended to leave the plank surface unpainted to take a stain....doh! Oh well - I just got some coarse (80) sandpaper and gave it a good rubbing along the grain. I then stained it with dilute brown acrylic and the result is OK for me. I then used dilute acrylic (mostly brown) wet and dabbed with kitchen towel and then dry brushed to give a little weathering. The wheels and axles were painted with leather brown acrylic with a little black added. I was happy with the result, so I got four more packs! The real advantage of the multiple build comes with the use of the chop saw. 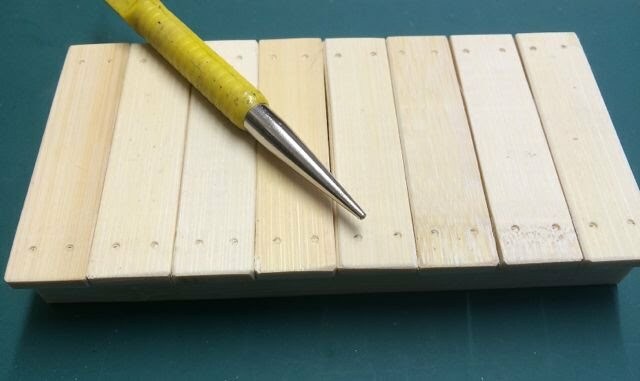 I was able to take a pack of ten and with three cuts (one to remove the pointed ends) I had 30 planks. Four labels from my second pack gave me the other ten I needed, plus two spares. I cut all eight side frames with one cut ......well you get the idea! The five wagons were cut out and glued together in a morning. The nail holes were punched and the dumb buffers marked for the hooks. The nail punch I had used came in a set of three so I decided to try the large one. It worked - giving the effect of a slightly recessed coach bolt head. 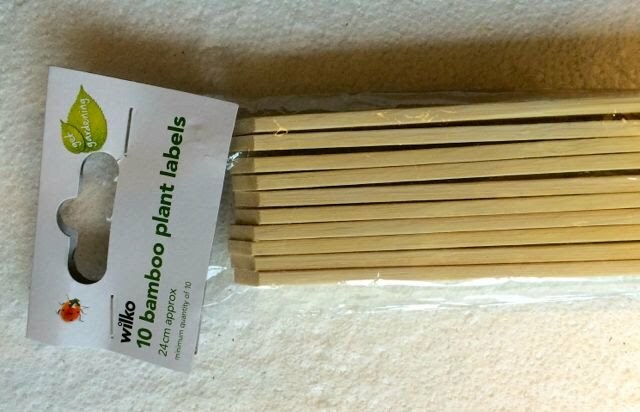 The bamboo takes the imprint well with no splitting or lifting - much better than soft wood. It does need a hard 'anvil' behind it though so It might be easier to punch the side frames before assembly. Here you can see the marked frame, after punching (yes, I must be more accurate!) and with a thin coat of primer. The bottom one is the one with the brass tacks. I am currently waiting for four more sets of wheels and axle boxes from Binnie Engineering (they are a bit snowed under with orders) so I have only finished one of the five. It still needs the tie down brackets - but you can see that the bolt heads are reasonably effective once touched in with a little paint and weathering. OK - the wheels arrived from Peter Binnie at Binnie Engineering. These have to be one of the best bargains in the hobby - see Peter's page on my website www.summerlands-chuffer.co.uk - there is a link on the Welcome page. After marking out to get the spacing right (and this mostly agreed with where I had punched the bolt heads! ), I used rapid epoxy to glue the axle boxed to the side frames. Just as the glue starts to go off, I stand the wagon on its wheels on a flat surface to ensure that it will ride on squarely. I also fitted all the staples by drilling and fixing the shortened staples with super glue. After spraying with grey primer, I allowed them to dry and then used coarse sandpaper again - always working with the grain. Then a dilute stain mixed from brown, black and white acrylic. 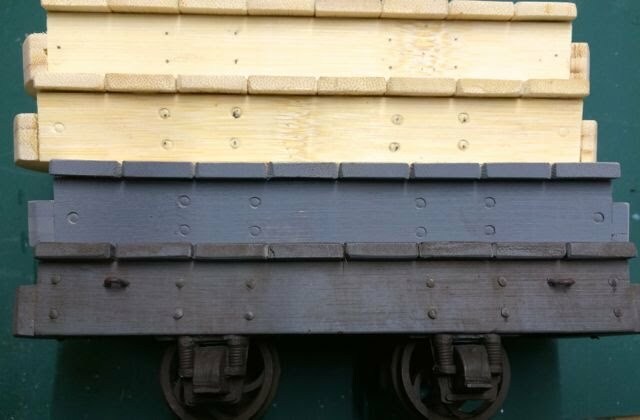 As these wagons had been made to the Summerlands GP Wagon dimensions, I could use the GP Wagon fittings - beams for slab carrying and the swivels to turn them into log bolsters (I think that log is a bit big!